Sciatica is the term used to describe back pain which radiates down the leg and is a symptom itself rather than a specific diagnosis. Sciatic nerve pain can be caused by a number of factors although a prolapsed or slipped disc is one of the most common along with piriformis syndrome. Sciatica pain usually but not always starts with acute low back pain radiating down into the buttocks, back of the thigh and lower into the legs. Sciatic pain may be sharp or acute and be accompanied by tingling, pins and needles or numbness. It is often triggered by a minor movement such as bending over to pick something up and often made worse by sitting, coughing or sneezing. Pain can often be relieved by lying down on one side. There may be tenderness and muscle spasm in the lower back with trigger points and tenderness in the buttock muscles. The straight leg raise test is one used to help diagnose sciatic pain. The therapist raises the leg, keeping the knee straight. The therapist moves the ankle into a dorsiflexed position which lengthens the nerve. If there are no neural symptoms (tingling, shooting pain or tight, restricted feeling throughout the back of the leg), then the therapist may ask the patient to raise the head to further increase the stretch. The slump test stretches the sciatic nerve. In a sitting position, the patient extends on leg out straightening the knee to put a stretch on the sciatic nerve. The stretch is then increased by tucking the chin down. Both sides are done for comparison. If the cause of your sciatica is thought to be spinal – i.e. coming from the lower back in the form of a disc prolapse, degeneration, stenosis etc, then you will probably be referred for imaging, in the form of either an X-ray or MRI scan. The medical term for sciatica is acute nerve root compression or radiculopathy which is pressure on the sciatic nerve resulting in symptoms of numbness, pins and needles and pain. The cause of pressure can be a slipped disc, also known as a herniated or prolapsed disc, disc degeneration which is wear and tear, or muscle tension for example from piriformis syndrome. Rarely something less common such as a tumor, bony growths called stenosis or infections of the spine can cause sciatica symptoms. A prolapsed disc, herniated disc or slipped disc as it is sometimes known is not simply a disc that has slipped out of place. Intervertebral discs separate the bones of the spine (or vertebrae) and their function is to act as shock absorbers for the spine and allow movement. They quite happily allow forwards and backward movement, sideways movement, and twisting. However, a combination of the two can put excess stress on the spine and damage the discs. For example, lifting a heavy object and then twisting. The intervertebral discs are filled with a gelatinous substance in the middle called nucleus pulposus and when a disc prolapses this jelly-like centre squeezes out and puts pressure on the spinal cord compressing the nerve routes and causing pain. Depending on where the sciatic nerve is pinched will determine where the pain radiates. 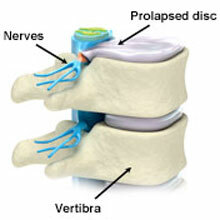 The L5-S1 disc at the very base of the spine is the disc most commonly damaged. The piriformis is a muscle found deep in the buttocks. 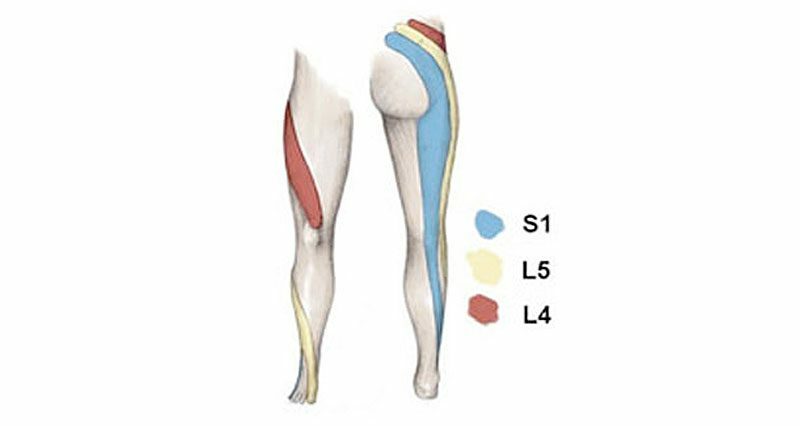 The sciatic nerve runs very close to this muscle and tension in the muscle can cause compression of the sciatic nerve resulting in buttock pain which radiates and down the leg. It is sometimes difficult to distinguish between sciatic pain caused by a disc problem, or piriformis syndrome. Generally, with piriformis syndrome, there will not be any lower back pain and there is usually a less well-defined point of injury. Treatment options really depend on the cause of the injury and the extent of the symptoms. Pain relief is the first priority. Severe cases which are usually caused by a prolapsed or slipped disc often require surgery although conservative treatment is usually tried first. Rest is important, in bed if necessary in a position that is comfortable. A doctor may prescribe NSAID’s (nonsteroidal anti-inflammatory drugs) such as ibuprofen but not if the patient has asthma. Applying heat therapy or a hot bath may help to relieve muscle spasm although cold is the priority if the pain is acute or inflammation is present. Using a heat retainer or back brace can provide support in the early stages. See a sports injury specialist or doctor who may advise starting extension exercises as soon as pain allows. Traction or stretching of the spine may be indicated and the use of an inversion table may help alleviate symptoms. 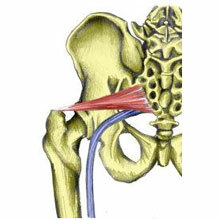 In less severe cases and those caused by piriformis syndrome, less rest is required. Rest from activities which aggravate the condition only. Keeping moving if possible is important. Gently stretch the hamstrings and buttock muscles (provided this is not painful). Apply heat therapy to help ease muscle spasm. Sports massage usually works particularly well for piriformis syndrome. Exercises can be used in mild to moderate cases of sciatica to ease symptoms and muscle tension. Exercises which are suitable for use by sciatic pain sufferers will depend on the severity of the symptoms and the exact cause of the pain. The main aim of the following exercises is to maintain lower back mobility and to decrease muscle tension and spasm. The exercises demonstrated here are examples only, we recommend seeing a Doctor or sports injury specialist for advice on specific exercises for your condition. Do not perform any exercises which cause pain or increase symptoms. Stretching exercises can be used to help reduce muscle tension. Stretches for the lower back and buttock muscles are particularly useful. Hold stretches for 20-30 seconds, rest and repeat the same stretch once or even twice more. Do this several times a day. Don’t stretch if you feel any pain at the time, or if you feel this exacerbates on condition later on. Mobility & strengthening – if your sciatica is caused by a lumbar disc prolapsed (slipped disc) then extension exercises are recommended to help reduce the compression of the disc on the nerve root. Again, stop immediately if there is any pain or discomfort. A professional therapist, osteopath or chiropractor will determine the cause of sciatica. A doctor may prescribe anti-inflammatory medication e.g. ibuprofen or muscle relaxants if necessary. They may use sports massage for the lower back to relax tight muscles and gently apply mobilization techniques to the spine. They may apply electrical stimulation in the form of a tens machine or interferential. In severe cases, a simple operation called a discectomy on a slipped disk if neurological signs or nerve related signs continue or worsen. These will start out as numbness or pins and needles but can develop with permanent symptoms and pain. Whether surgery is performed or not a course of Pilates exercises to strengthen the core muscles of the trunk is a popular option for managing back conditions. After the acute painful phase, that patient will be encouraged to restore pain-free movement to the back through mobilization and stretching techniques. Re-education on posture and correct lifting techniques are learned and maintained.